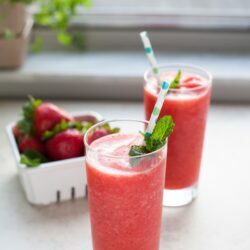 I had some extra strawberries and since I love love mojitos, I had to try to make strawberry mojitos yesterday but what better way to beat the heat than to make them into slushies. If you own a blender like I do, we both need to make more frozen drinks! Right? What did you do for July 4th? We were absolutely boring and made chicken pot pies. That makes no sense right? And we watched our neighbors do fireworks on their driveway. We totally do this every year but this year, we have some great outdoor furniture to enjoy them on. I can’t wait to share with you what we got from World Market! And these babies, I really really want to take up canning because I love strawberry jam so much. Excuse me while I go out to go buy more strawberries so I can keep making these fun things! 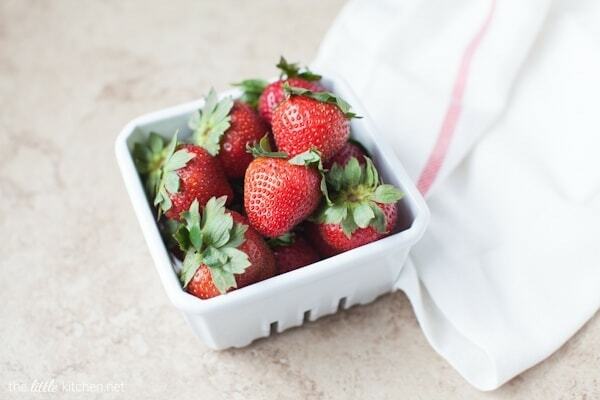 Do you have any strawberry recipe favorites? Please share, especially if you have a link! PS, check out my friend Aggie’s wonderful strawberry pinterest board if you’re looking for more ideas. It's really easy, just mix equal parts granulated sugar and water in a medium saucepan or pot and bring to a boil. Mix until the sugar has dissolved and then remove from heat. Add 5 to 8 mint leaves and allow to cool completely. The stronger the mint flavor you want in your mojitos, the longer you should infuse the mint leaves. It should only take a few minutes to make simple syrup! 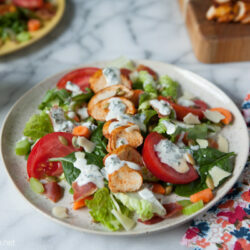 You'll have extra so you can store this in the fridge for a few days. Here are more strawberry recipes! Absolutely gorgeous! Love all that fresh fruit flavor in my cocktails. Pinned! These look so refreshing, gorgeous color! I don’t think I’ve ever had a mojito before but it sounds really good with the strawberry. This just screams summertime, parties, friends, being outside…love it, Julie! Pinned! So I hardly drink ever, but the one drink I will always partake in are mojitos. They are SO GOOD! And this sounds even better. Love it! What a fun drink for hot summer days! Being a huge fan of strawberries, I know this is going to be great! Pinning! I love mojitos…these look so refreshing and healthy! Lots of vitamin C. Citrus rum…I am intrigued. Thanks for sharing. I am with Curtis on the tacos….always a yes in my book. 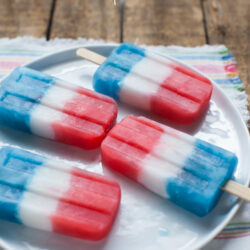 These look so refreshing and delicious. I’ve never had a blended mojito, but that needs to change! I also love love mojitos. . yum! These look great and hey, nothing boring about chicken pot pies. . yum! I fully believe every adult beverage should be made into slushy form. These are gorgeous Julie!! Ha, I love that you made chicken pot pies for the 4th! These slushies look SO good! I love a good frozen mojito! 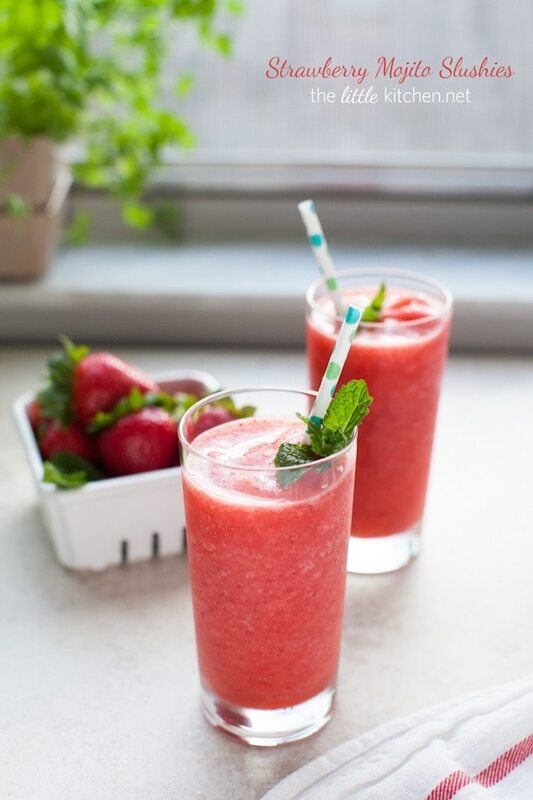 It is strawberry season here in Maine and I think these slushies would be great to make. I did make up some Strawberry Shortcake Whoopie Pies http://www.sweet-morris.blogspot.com/2013/07/strawberry-shortcake-whoppie-pies.html. SO pretty!! I must make a virgin version. Love these! 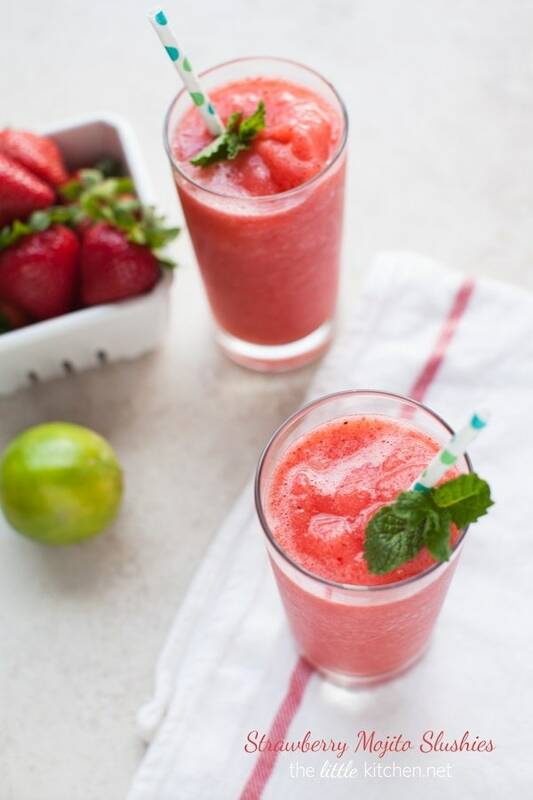 I love strawberry mojitos, but never though to turn them into a slushie! You should look into making freezer jam – much easier than canning! Yum! I love mojitos and this year I have chocolate mint in my garden! I can’t even tell you how much I need this right now! Come to mama! And I’ve been obsessed with blueberries lately. These are so pretty! I love the idea of a mojito as a slushie – super fun for summer! What I love most about Strawberry season, is my granddaughters 2.5 & 7 yo – are strawberry picking angels!!! This Nana gets to share the joy of creating something from something they picked with their own to hands. So far we’ve nailed strawberry smoothies and of course, my own grandmothers strawberry jam canning recipe! Gotta love traditions! Yum! We are big mojito fans in our home… love the idea of making slushies! Perfect way to cool off during the dog-days of summer! With the weather making me melt right now, this is just what I need! Thanks! Mojitos make me so happy. Just saying them puts a smile on my face. Drinking them makes me jump for joy! We didn’t do anything for July 4th! It was my first day of work after 5 or 6 weeks of vacation. So that was kind of silly. And loooove these mojitos! So pretty and fresh and perfect for summer. Oh yum! This drink is so perfect for the summer time 🙂 I Love strawberries!